C1305. SERGE KOUSSEVITZKY Cond. Boston S.O. : Symphony #1 (Roy Harris), Live Performance, 2 Feb., 1934, Carnegie Hall; Symphony #3 (William Schuman), World Premiere Performance, 17 Oct., 1941, Symphony Hall (Conducted by the dedicatée). (Canada) St Laurent Studio YSL 78-238. Transfers by Yves St Laurent. 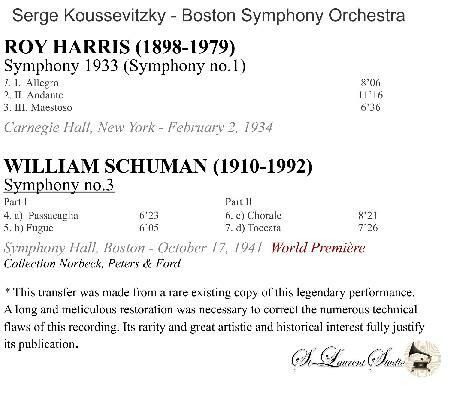 In 1924, Koussevitsky was chosen as music director of the Boston Symphony Orchestra. With the BSO, he continued his tradition of championing the new music he found around him, thus giving vital exposure to great American composers, such as Copland, Barber, Bernstein, Carter, Hanson, Harris, and a host of others over the years. During the 1931 season, he commissioned a series of commemorative works for the orchestra's fiftieth anniversary, yielding a treasury that included Stravinsky's SYMPHONY OF PSALMS and Ravel's Piano Concerto in G. Beginning in 1935, he annually brought the orchestra to the summer Berkshire Festival, organized by Henry Hadley in 1934, becoming its music director and making it part of the BSO's operation. Koussevitzky established the Berkshire Music Center (now Tanglewood Music Center) in conjunction with the festival in 1940, making it into one of the premier American educational institutions where young musicians could polish their craft and network. 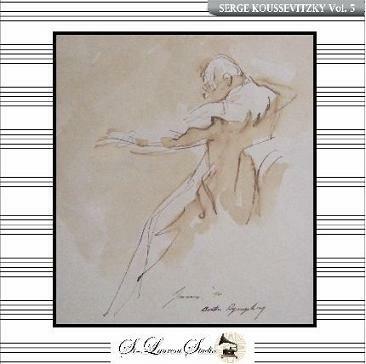 After his wife died in 1941, Koussevitsky set up a foundation to commission works in her memory. Britten's opera PETER GRIMES was one of the first works that resulted. Until his death in 1951, he continued to direct both the Boston Symphony Orchestra and Berkshire Festival, recording frequently."